It was not just usual competition, but probably one of the main steps for American powerlifter in armwrestling. And Scot made important conclusions after Zloty Tur! Scot, how do you feel after your first professional competition? – I will go to Zloty Tur from now on. It's so nice to be around the best in the world. I am used to that. I like that where it is serious. What was the most impressive for you in fights? – I was into the Vendetta fights. All the fights were great. I want to armwrestle and conquer in Vendetta. I don't watch while I compete. I don't care who I go against. Too much concentration lost by doing that. 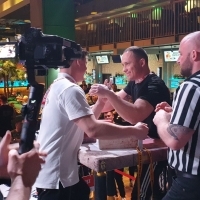 - Does Zloty Tur motivate you to do armwrestling harder? – I went to Zloty Tor to see if I can take it from the best. I now know that I can. It showed me what I need to work on. It was an eye opener. I will be a different man come 2018. I Scot Mendelson. I am an armwrestler!